Spitzbergen is almost completely surrounded by ice. 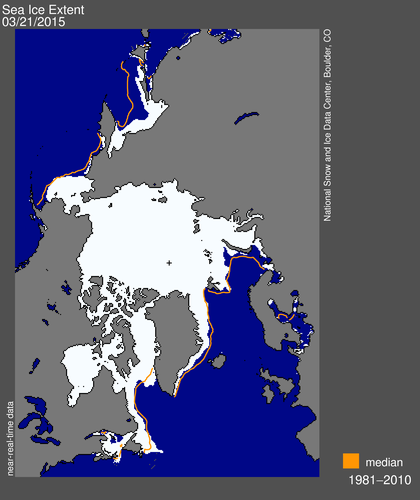 Since you have posted this in March the sea-ice has basically flat-lined. It may be because the AMO is shifting to its “cold phase”, especially between Iceland and Labrador. At this point (April 15) the ice is not getting flushed down into the Atlantic, and even the Russian “North Pole” base called “Barneo” has stopped drifting south and is drifting back north. Even though a lot of the tourists are parrots in the Alarmist echo-chamber, they do take a lot of pictures, and such pictures are worth more than a thousand words of death-spiral blathering, for they show solid ice. and would find a place to land even in May, to deliver food or pick them up, if need be, and this year “Kenn Borek Air” decided not to offer that service. However there is a lone adventurer named Thomas Ulrich heading from the Pole to Canada, and hopefully he will post pictures, worth more than a thousand words, which will show the way the ice is piled up as you get to the Canadian coast. I follow him through the explorersweb.com site. You might get some good pictures to use in your sea ice posts, if he is not eaten by a polar bear.